Born Delavan, Wisconsin, November 23, 1961; married; 2 children, 3 grandchildren. Graduate Lincoln High (Manitowoc), 1980. Owner, vacuum and sewing center. Member: National Rifle Association; Eagles Manitowoc; Manitowoc County Home Builders Association. 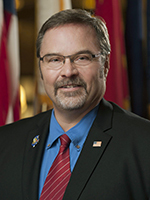 Former member: Economic Development Corporation; Wastewater Treatment Facility Board; Manitowoc Crime Prevention Committee; Community Development Authority; Safety Traffic and Parking Commission; Wisconsin Utility Tax Association, 2009–13; WCA Taxation and Finance Steering Committee, 2010–13; WCA Judicial and Public Safety Steering Committee, 2010–13. Manitowoc City Council, 2004–08 (president 2006–07); Manitowoc County Board of Supervisors, 2006–13 (chair 2010–12).